This post was originally published on the blog for the Museum of the Order of St John, available here. One of the best things about working in a small museum with a small team is the variety of my role. As the Museum’s office assistant I organise guided tours and look after financial administration, but I help out with many other jobs too, from messy children’s activities through to object photography in the collections stores. I particularly enjoy working on tasks involving design, branding and visual communication, and whenever these come up I like to be involved. Most of these jobs are quite small in scale; they might involve laying out the Museum’s volunteer newsletter, or designing greeting cards for the Museum shop. However, I was recently asked to work on a much bigger project. 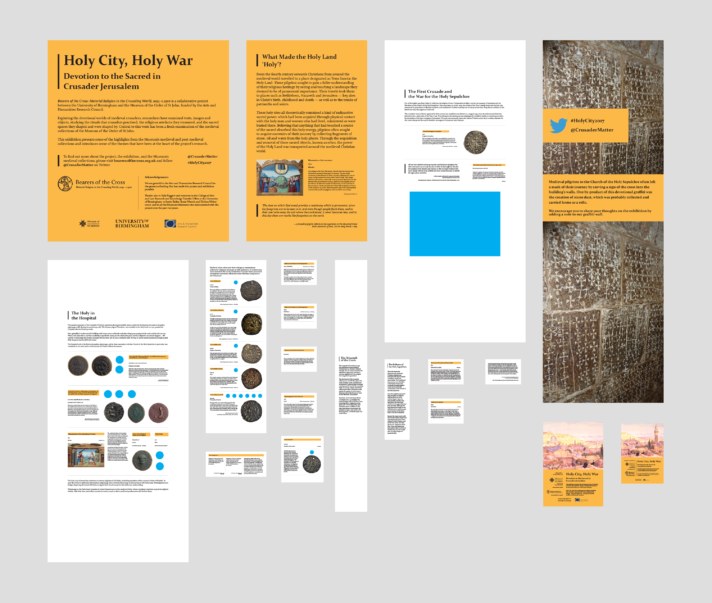 The task at hand was to create graphic layouts for Holy City, Holy War, a whole new Museum exhibition focusing on the Crusades. Of course I said yes! Designing layouts and signage was a new challenge for me, but I have a background working in illustration and I’ve designed websites as well. This prior knowledge, and particularly the experience I’d gained working with Illustrator, Photoshop and InDesign, proved useful. Another huge help was the exhibition text written by William Purkis of the University of Birmingham, a Crusades specialist who has worked extensively with the Museum on the Bearers of the Cross project, which documents many of our medieval objects. The exhibition has a very strong narrative which follows the story of the early Crusaders, their beliefs, and their practices through key objects from the collections including coins, wax seals, and wooden models. This document was my main reference point, and all the signage and layouts I designed aimed to support the interpretation and preserve the narrative of the text as best as possible. My main challenges on this project were accessibility and practicality. It was important for the exhibition text to be well-lit and to meet legibility standards so anyone could read it comfortably, but we also had to work within the constraints set by the gallery space and the display cabinets we already had. It’s easy to underestimate how large a piece of text should be when you are used to reading from a page or a screen, or to forget just how dark galleries can be when their spotlights aren’t pointing where you’d like them to! Because of this, mock-ups were an essential tool during the design process. I improvised some simple but effective signage mock-ups using sticky tape and multiple sheets of A4 paper to get a sense of the physical presence of full-sized signage in the galleries, check readability and test how things looked under lighting. I also made some digital mock-ups, quick tests which were useful for checking how signage might look in situ and for experimenting with different configurations of objects and signage in display cases. These were particularly useful as a way to test layouts for delicate objects without having to get them out and handle them repeatedly. Another purpose of the signage was to offer additional visual interpretation to give visitors a different insight into the objects on display. The exhibition features several Crusades-era coins, and I worked with the Museum curator Abi Cornick to explore the possibilities of how these might be displayed. These tiny, widely-dispersed objects were decorated with words and images carefully chosen to convey important religious or political ideas to a far-flung public. We knew it would be important to share this detail with exhibition visitors, but it was difficult to do so when the original objects were so small. Our solution was to display the coins alongside enlargements which would bring out the fine detail that reveals these objects as important artefacts. We made use of pre-existing high resolution photos which had been taken for the Bearers of the Cross project and installed the objects themselves alongside their enlargements in a way which would allow visitors to see both together. These striking displays were one of our favourite parts of the exhibition. When layouts are done properly, they aid the interaction between visitor and exhibition almost invisibly. Everyone appreciates a well put-together display it can be hard to pinpoint what makes a one good or bad. When I started working on this project I wanted to create a clear, consistent, and professional look for the exhibition graphics, but along the way I’ve discovered the important role that accessibility plays, and learned about the imaginative possibilities of visual interpretation alongside text and objects. It has also been amazing to see the progress of an exhibition from the page through to installation in the galleries. It’s been a fascinating experience, and I’ll certainly be looking that little bit closer on my next trip to see a new museum exhibition.